Name, choice of site location and original concept paper was the work of activists, Jim Embry and Bruce Mundy first rendered in the fall of 2006. Isaac Murphy Memorial Art Garden concept paper presented to the Leadership Lexington Class of 2006-2007 October 6, 2006 by Jim Embry, Co-director of NELI, NorthEast Lexington Initiative. 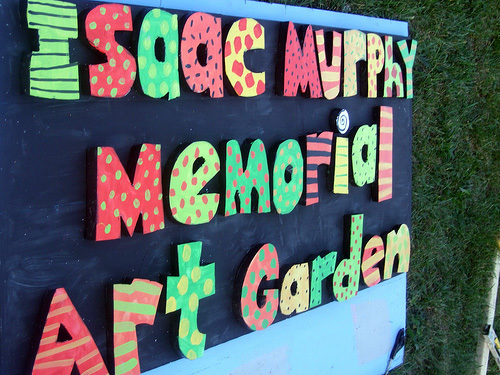 The Isaac Murphy Memorial Art Garden is located on a piece of land just over a half-acre in size that is bordered by Midland Place, Nelson Avenue and Third Street. It designed to honor jockey Isaac Murphy, the three-time Kentucky Derby winner who has been called the greatest jockey of the 19th century and to focus on the contributions of African Americans to the racing industry. We would also highlight northeast Lexington's role in the history of thoroughbred horse racing. Click here for the article "Activist hopes Garden will inspire youth"
Click here for an article from the Lexington Herald-Leader (12/07/07) explaining the garden's reason and purpose.